Priced at around $1000, the Memory Craft Embroidery Machine is one of the highest-rated embroidery-only machines on the market. Indeed, while it doesn’t come with multi-purpose capabilities like what you can find on the Janome Horizon 12000; this particular embroidery machine is quite affordable for a Janome model. With this model, sewers can benefit from 100 built-in embroidery designs and 3 alphabet fonts, as well as the chance to expand their collection thanks to its USB compatibility. With a unique rotating feature, the 300E also has the added advantage of being extremely easy to use, hence allowing you to enhance and build your embroidery skills. This is why the machine is often favored by users who want to start their own home-based business and use their embroider skills to earn some extra money on the side. With adjustable speeds and a fully computerized system, the Memory Craft 300E will undoubtedly help you finish your projects faster than expected. You can also compare it with other models on our top 8 embroidery machine reviews. In spite of its multiple features, the machine did display just a few minor and insignificant drawbacks. For example, some sewers claimed to have been quite unsatisfied with the machine’s built-in lights. Consequently, this made it problematic for these sewers to use their machines whenever they wanted to, especially if the weather was dark outside. Another person found that the machine often produced a series of broken needles. However, this was later found out to be an issue with the tension setting, rather than a problem with the actual machine itself. Still, while it admittedly does have a few cons to its name, the Memory Craft 300E remains a highly recommended buy, especially because of its wide range of features and its user-friendly features. Featuring a larger-than-average embroidery area of 5.5 x 7.9”, this particular model can be used to embroider bigger designs without the need of rehooping. This ensures that you always benefit from the most appropriate and precise angles for a highly professional finish. In fact, since you won’t need to repeatedly rehoop to make your designs fit in the embroidery area, you will enjoy a highly comfortable embroidery experience which means that you can work for longer periods of time. This will help you cut back on the number of days required to complete your projects. The large embroidery area is also designed to accommodate several embroidery hoops- something that more professional sewers will undoubtedly appreciate. It comes with a 4.75 x 5″ and a 5.5 x 7.9″ hoops. This also makes it extremely easy for you to work with various types of fabrics such as silk, satin, cotton, polyester, denim, leather, gauze and the likes. Practically no user complained about the machine’s ease of use: quite on the contrary, the 300E has been hailed as one of the easiest and most comfortable machines to work with, especially because of its computerized feature. Therefore, sewers can literally control everything at the mere swipe of a button, hence ensuring efficiency and professionalism. The Memory Craft 300E even comes with an automatic needle threader that is activated through the LCD screen: therefore, as soon as users select their option from the touch screen, the machine activates a mechanism that automatically guides the thread through the needle. Similarly, the LCD screen can be used to automatically adjust the tension setting. The Janome 300E sports an adjustable speed that goes up to 650 spm. This will help you finish your project as quickly as possible, while leaving time for artistic edits. Because of its USB compatibility feature, this model remains completely upgradeable and will help you benefit from the latest Janome software. You can also plug it to your computer or laptop to easily transfer as many embroidery designs as you want. Sewers will be glad to learn that the 300E also comes with 2 and 3 letter emblems as well as 3 embroidery fonts built-in. This makes it far easier for you to monogram and personalize various home decorating accents like towels, napkins, cushion covers, couch covers, bathrobes and other similar items. As far as editing is concerned, you can resize your design from 90% to 120%. Best of all, unlike other machines, this model allows you to benefit from a unique stitch counter as well as a time indicator for each embroidery design. It is even packed with no less than 100 embroidery designs to help you add some extra flair to your projects. While the Janome 300E is similarly priced to the multi-purpose machine Singer Futura Quartet; when it comes to its embroidery mode, the 300E proves superior by sporting the smooth performance and quality build characteristic of Janome. 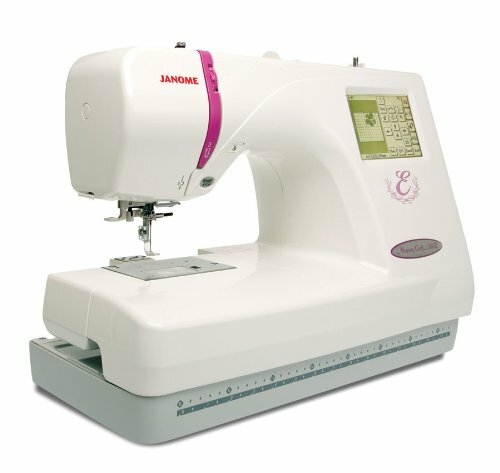 The best part is that, while it might seem a bit expensive for an embroidery machine, compared to other Janome models, the 300E is quite reasonably priced.